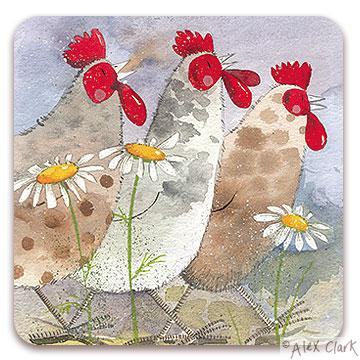 An delightful coaster from Alex Clark called "Three Hens". Featuring three elegant looking hens out for a walk amongst the daisies! Painted using a wonderful array of pastel colours in Alex Clark's distinctive style. The cork backed coaster has a wipe clean surface to keep it in immaculate condition. An ideal gift for any shooting enthusiast or country lover!